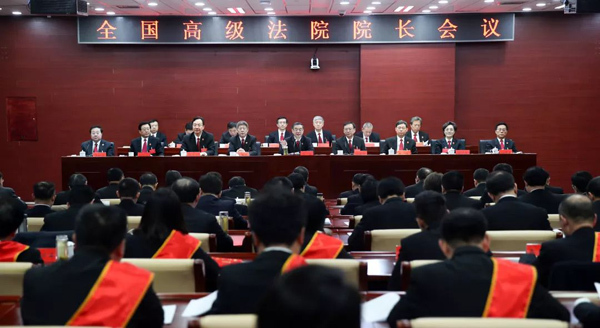 The National Conference of the Presidents of High Courts closed on Jan 17, having reported on judicial achievement at various levels in China in 2018 and outlined the judicial work required in 2019. At the conference, Zhou Qiang, president of the Supreme People's Court (SPC), affirmed courts' judicial performances in administrating justice for the people and maintaining judicial fairness, which safeguarded national security and maintained a stable society while supporting high-quality economic development. In addition, he praised their promotion of judicial reform, establishment of smart courts and construction of a modern legal system, which improved judicial transparency and efficiency. Zhou also mentioned that in 2018, court staff improved their judging capacity and judicial infrastructure and promoted informatization construction. 2019 is the 70th anniversary of the founding of the People's Republic of China. The meeting required courts this year to closely center on the goal of letting the people feel fairness and justice in each case, administer justice for the people and maintain judicial fairness, deepen judicial reform and continue to advance smart courts to promote justice and safeguard a sound and stable society. Zhou said courts must continue offering judicial assistance for reform and opening-up in 2019 and keep optimizing judicial theories and enhancing their judging capacity to support China’s high-quality development and meet the people's increasing judicial demands. The conference outlined key judicial work in 2019, which includes using the Criminal Procedure Law to strictly punish all types of crimes, fighting against gang-related crimes to protect human rights, and strengthening trials of intellectual property and foreign-related commercial and maritime cases to support innovation-driven development and opening-up. Serving the people was given an important position in the 2019 missions. According to the meeting, courts must construct modern litigation service centers and provide high-quality and easy judicial assistance for the people. Courts were encouraged to learn from the mediation experience of Fengqiao town in Zhejiang province, which improves people's engagement in solving disputes. Optimizing the use of alternative dispute resolution (ADR) and the split-flow model, which diverts complicated and simple cases into different channels to improve efficiency, was also outlined at the meeting. Deepening judicial reform and building smart courts are still two main targets in 2019. High-technology such as big data, artificial intelligence and block chains should be adopted in future judicial work to improve management of digital files. Jiang Bixin, vice-president of the SPC, stressed that courts must focus on enforcement of livelihood cases to maintain judicial fairness and to protect people's rights and interests. Jiang reiterated that resolving difficult enforcement problems is a key task in 2019. Courts must learn from experience and establish a long-term mechanism to continue the campaign, he added. He also urged all courts to concentrate on preparation for the two sessions which will open in March. Also present at the meeting were SPC leaders, delegates from high courts of various provincial regions and the PLA Military Court, deputies to the National People's Congress and members of the national committee of Chinese People's Political Consultative Conference, models of judicial personnel and outstanding judges.